The Castle Sticky Wall takes normal Sticky Walls to royal heights! 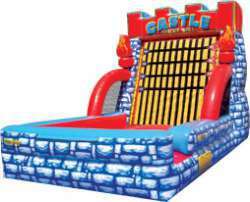 Guests step into a sticky suit, and then take their turn at storming the castle. Once they reach the end, the oversized inflatable Velcro wall catches participants in mid-jump.